Whetstone Gulf State Park is less than 40 miles from your cozy cabin rental at Wellnesste Lodge. Following scenic country roads from Taberg, NY to Lowville, NY this state park offers a variety of outdoor activities for individuals and families. 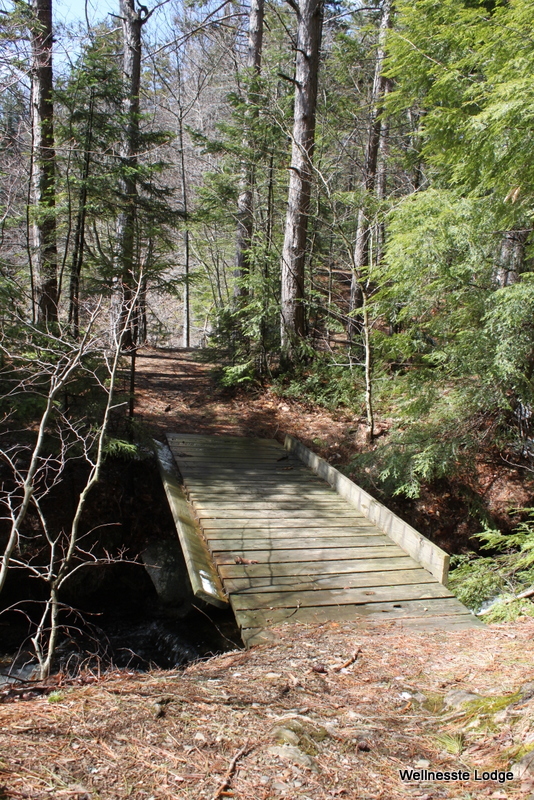 Situated on the eastern edge of the Tug Hill Plateau, this park is a wonderful spot for Wellnesste Lodge cabin rental guests to take in a day hike and explore over 2,400 acres of scenic New York forest, rivers and waterfalls. Park History: The Park was enjoyed by early settlers in Upstate NY starting in the early 1800's. Local oral history reports that the gorge was an active part of the Underground Railroad during the Civil War era. This is easy to imagine as the gorge's location is secluded and would have made a fine place to seek refuge while enjoying the bounty that Mother Nature provided (food and water) to live on. Over the generations, the area was recognized for its natural beauty and significance, the State of New York eventually made it into park of the state park system for all to enjoy. Origin of the Whetstone Gulf Name: A Whetstone is generally a smooth rock used to sharpen knives. Although I couldn't confirm it with the rangers, I surmised that the Whetstone name came from the fact that the gorge in the park is comprised of shale and other smooth rocks that were used as whetstones in the early days. The "gulf" portion of the name comes from the fact that the park encompasses a 3 mile long gorge which is cut by Whetstone Creek (which is a raging river by most standards, especially in Spring following the snowmelt of infamous portions). This gorge is acclaimed as one of the most spectacular scenic vistas east of the Rocky Mountains. You can see the dark grey slate that seems to make up much of the gorge wall as you hike high above on of the park's trails. In addition to these rock formations, there are limestone deposits in the region which have had a reputation for serving as both shelter during the Underground Railroad days and as sinkholes for capturing farm animals. One local farmer purportedly lost several cows to an unstable limestone cavern and consequently destroyed the entrance to said cavern. Hiking at Whetstone Gulf State Park: The main trails (named North Trail and South Trail) rim the gorge in a 5 mile loop that has a climb of perhaps one to two thousand feet... enough for a great workout, but not so tough that the whole family can't enjoy. We advise our cabin rental guests that they wear adequate hiking boots, bring a walking stick and to be sure to bring a camera. Because the trails rim the gorge, there are warning signs along the route to remind everyone not to get too close to the edge. Speaking from experience, there is a precipitous drop in several areas so kids need to mind there parents at all times. My exploration was on April 25th and thus it was a spring time adventure. Surprisingly, when I began my assent snow flurries, followed by sleet greeted me. Within an hour of my hike, the sun began to shine over the horizon onto the Northern Trail which felt wonderful. Most of the trail was free of standing snow except for at the highest elevation where small pines shaded the trail and thus left about 18" of snow to hike through for a short spell. With the melting snow came a fair share of mud and standing water to avoid, but the effort was well worth it. I enjoyed stands of sponge-like moss and their lime green coloring as a contrast against the snow. I also witnessed Trout Lilly leaves poking through the detritus on the ground in an effort to capture the sunlight while it was available and cooperative. Here are a few more highlights and things that I loved about this park and what it had to offer. • The Red Pines, Norway Spruce and Eastern Hemlocks made the air smell fresh and sweet. These conifers combined with copious snow reminded me of my many hikes in the Smoky Mountains of Tennessee. • The initial climb of the North Trail admittedly made me huff a bit (I was out of shape after a long winter), but not so much that I wanted to turn back. The climb was well worth while as within thirty minutes I was well above the gorge and enjoying beautiful vistas. • The sights and sounds of migratory birds filled the trip and I enjoyed seeing special avian friends such as Redpolls, Brown Creepers, Wood Ducks, Thrushes and a Bald Eagle. • The lingering thought of potentially seeing a Black Bear made the sense of "adventure" all that more exciting. Although they are fairly rare, these Ursus are native in the area and I must admit that just that fact alone made me more attentive to my surroundings. Alas, I didn't see any bears, but perhaps next time around! • The whirling white blades of Lowville's famous wind farm in the distance as I reached the half way point of my hike. Seen through the pine trees, I could spot at least 30 of these slow swirling white giants that were passively harvesting what nature provides each and everyday on these ridgelines- wind power. • The multitude of water features. The gorge no doubt is the highlight and the thundering roar was so loud at times it drowned out all other sounds in the area. In addition to the obvious namesake of the park, I crossed at least 5 small streams that originated in the highlands and trickled by me to a foreboding plunge into the gorge below. These streams thus made up waterfalls of various sizes and were all over 100 feet high... very cool stuff indeed! Although I didn't get there this time around, above the gorge lies the Whetstone Reservoir which is a 500 acre lake. Cabin rental guests at Wellnesste Lodge who enjoy fishing, can venture out to this lake which is stocked with tiger Muskie and large-mouth bass. The lake is also a popular spot for cabin getaway canoeing and kayaking. I intend to return there with my kayak one day for further exploration. As I ended my hike and made my way back to the parking area close to the Ranger's quarters, I spoke to the local Park Ranger who informed me that park remains open in the winter for snowshoeing. I imagine that a hearty snowshoe hike during a Cabin Rental Adventure through 3-6 feet of Tug Hill Plateau snow along the gorge rim would also be a worthwhile promenade. Something else to put on the bucket list!